The story of the flea market starts in 1860 when, at Napoleon III’s request, Baron Haussmann incorporated Paris’ outlying villages into its territory. The rag-and-bone men (chiffonniers, in French) then “emigrated” outside of the city along the Malassis zone, a wasteland located behind the Thiers fortifications that now encircled Paris, joining the gipsy caravans that had already been there for some time. – the Malassis zone was not subject to tax, as it was located outside of the Paris city limits. This was the start of the Flea Market, which would continue to evolve over time, with the construction of brick-and-mortar buildings, for example. Eventually, it was relocated. Today, the Marché aux Puces de Saint-Ouen is the biggest flea market in Europe: 15 ha, 2,000 sellers, and 2 million visitors annually. It isn’t easy for first-timers to find their way around. 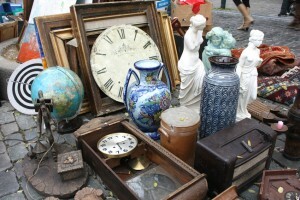 You not only have to get to the 15 markets devoted to antiques without stopping at the clothes markets that precede them, you then have to know where to start and where to find what you’re looking for: trinkets, Art Deco, Napoleon III, the 1950s, 18th-century objets d’art and furnishings, 19th-century furniture and decorations, paintings, ceramics, treasures from the Far East, vintage clothing, vinyl records, unusual objects… discover the pleasures of treasure hunting!